فخریان روغنی, عباس. (1394). بررسی امکان ساخت خمیرکاغذ کرافت از چوب درخت کریپتومریا. مجله صنایع چوب و کاغذ ایران, 6(1), 145-157. عباس فخریان روغنی. "بررسی امکان ساخت خمیرکاغذ کرافت از چوب درخت کریپتومریا". مجله صنایع چوب و کاغذ ایران, 6, 1, 1394, 145-157. فخریان روغنی, عباس. (1394). 'بررسی امکان ساخت خمیرکاغذ کرافت از چوب درخت کریپتومریا', مجله صنایع چوب و کاغذ ایران, 6(1), pp. 145-157. فخریان روغنی, عباس. بررسی امکان ساخت خمیرکاغذ کرافت از چوب درخت کریپتومریا. مجله صنایع چوب و کاغذ ایران, 1394; 6(1): 145-157. دراین بررسی ویژگی‌های شیمیایی، آناتومِیکی، خمیرکاغذ و کاغذسازی درخت سوزنی برگ کریپتومریا از منطقه پیسه‌سون استان گیلان مورد بررسی قرار گرفت. متوسط جرم ویژه نسبی خشک و بحرانی چوب این درخت به‌ترتیب 0/376 و 0/338 گرم بر سانتی‌متر مکعب و میانگین طول تراکئیدها، قطر تراکئیدها، قطر حفره سلولی و ضخامت دیواره سلولی تراکئیدها به‌ترتیب 2/92 میلی‌متر، 41/23 میکرون، 32/57 میکرون و 4/41 میکرون اندازه‌گیری شد. میزان هلوسلولز این درخت 71/88% و میزان αسلولز، لیگنین، خاکستر و مواد استخراجی آن به‌ترتیب 35 /48، 32/08%، o/988% و 5/644 % اندازه‌گیری شد. بازده کل خمیرکاغذهای کرافت در این تحقیق به‌طور متوسط 50/53 درصد به‌دست آمد. با افزایش میزان قلیائیت مؤثر از 12% به 18% بازده خمیرکاغذها کاهش یافت که این اختلاف کاهش در سطح اطمینان 99% معنی‌دار شد. با تغییر زمان پخت نیز اختلاف بازده خمیرکاغذها در سطح اطمینان 99% معنی‌دار شد. میانگین طول پاره‌شدن کاغذها در قلیائیت مؤثر 12 درصد 7/36 کیلومتر، در قلیائیت مؤثر 14 درصد برابر 7/17 کیلومتر و در قلیائیت مؤثر 18 درصد 9/14 کیلومتر و میانگین مقاومت در برابر ترکیدن آن‌ها در قلیائیت مؤثر 12 درصد kPa.m2/g 4/87، در قلیائیت مؤثر 14 درصد kPa.m2/g 4/93 و در قلیائیت مؤثر 18 درصد مقدار kPa.m2/g 6/19 به‌دست آمد. Afrabandpay, E., 2001. Properties of paper: An introduction (Translated), Publication of Agricultural Science. ISBN:964-6832-41-5, 153 p. Foam., 2006. Food and agriculture organization (FAO) of the united nations, website Statistics. Bodîrlău, R. and Teacă, C.A., 2008. Softwood chemical modification by reaction with organic anhydrides. Revue Roumaine de Chimie, 53(11): 1059-1064. Faezipour, M., Hamzeh, Y. and Mirshokraii, S.A., 2000. Evaluation of Kenaf as a Raw Material in Pulp Production. Iranian Journal Of Natural Resources, 53(3): 241-249. (In Persian). Fakhryan, A., Hosseinzadeh, A., Golbabaei, F. and Hosseinkhani, H., 2003, Investigation on delignification and pulping of Spruce (Picea abies). Wood and Paper Science Research, 18(2): 219-238. Fengel, D. and Wegener, G., 1989. Wood: chemistry, ultrastructure, reactions. Walter de Gruyter, Berlin, 613 p.
 Franklin, G.L., 1954. A rapid method of softening wood for microtome sectioning. Tropical Woods, 88: 35-36. Golbabaei, F., Jahan Latibari, A., Hosseinzadeh, A. and Nourbakhsh, A., 1998. Investigation on of kraft pulp from Pinus eldarica. 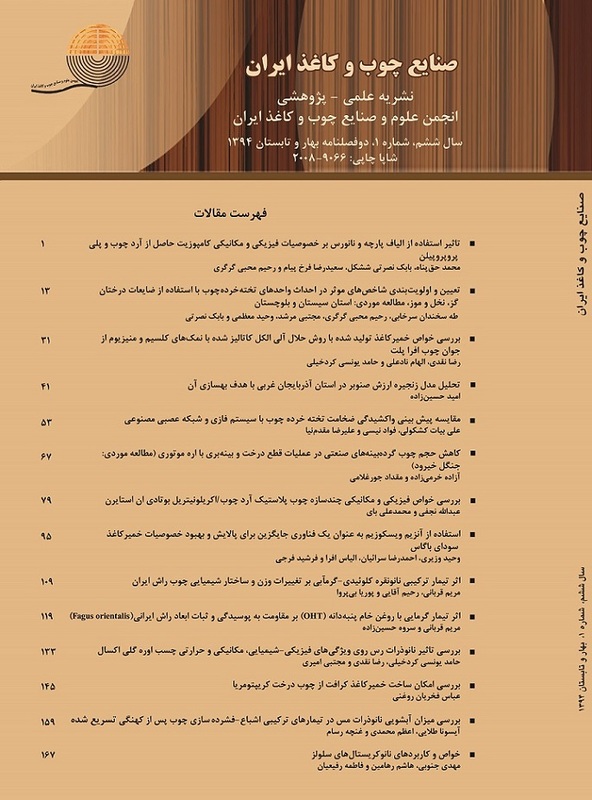 Iranian Journal of Wood and Paper Scienc Research, 5:1-64. Hosseini, S.Z., 2000. Fiber morphology in wood and pulp, Gorgan University of Agricultural Sciences and Natural Resources, 288 p.
 Jahan Latibari, A., Fakhryan Roghani, A., Kargarfard, A. and Golbabai, F., 1998. Properties of kraft pulp from Spruce wood grown in north of Iran, Pajouhesh and Sazandegi, 39: 59-64. Jahan Latibari, A. and Hosseinzadeh, A., 1994. Pulping technology: alkali pulping, Islamic Republic of Iran, Ministry of Jahad-e-Sazandegi, Research Institute of Forest and Rengelands Press, 213 p.
 HawFarn, L., YawFuh, H. and Hweig, W., 2000. Remove from marked records comprehensive evaluation on the relationship between mechanical pulping conditions and paper properties (II) chemithermomechanical pulp (CTMP), Bulletin of National Pingtung University of Science and Technology, 9(1): 21-32. Shackford, L.D., 2003. A comparison of pulping and bleaching of kraft softwood and Eucalyptus pulp. 36th international pulp and paper congress and exhibition, October 13-16, Sao Paulo, Brazil. Mirshokraei, S. A., 1997. Handbook for pulp and paper technologists. Payamenoor University Press, 454 p.
 Mirshokraei, S.A. and Sadeghifar, H., 2002. The Chemistry of Paper, Ayizh Publications, 184 p.
 Onodera, I., Kamijo, Y. and Miyanishi, T., 2003. Mechanical pulping of Cedar (Cryptomeria japonica), Japan TAPPI Journal, 57(11): 65-72. Palmer, E.R. and Tabb, C.B., 1974. Production of pulp and paper from coniferous species grown in the tropics. Tropical Science, 10(2): 79-99. Parsapajouh, D., 1984. Wood technology, University of Tehran Press, 370 p.
 T APPI test methods, 1992-1993. Fibrous material and pulp, paper and paperboard testing.TAPPI press, Atlanta, CA, USA. Tutus, A., Cenk Ezici1, A. and Ates, S., 2010. Chemical, morphological and anatomical properties and evaluation of cotton stalks (Gossypium hirsutum l.) in pulp industry, Scientific Research and Essays, 5(12): 1553-1560. Uraki, Y. and Sano, Y., 1999. Remove from marked records polyhydric alcohol pulping at atmospheric pressure. Holzforschung, 53(4): 411-415.